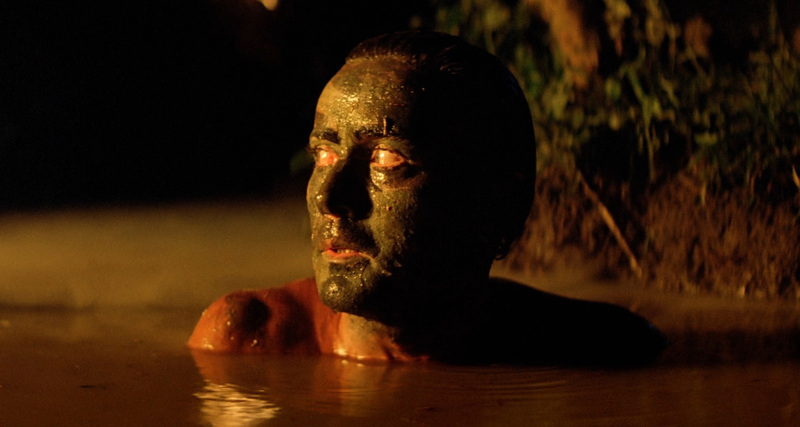 The Man Who Stares At Screens: Apocalypse Now Remastered - or how to make a masterpiece look bland. Apocalypse Now Remastered - or how to make a masterpiece look bland. WooHoo! I'm back, yes after nearly twelve months without a post here I am again. I offer no excuses for my absence, it's the usual story.... Start blog, get excited about blog, realize nobody is reading blog, get depressed about blog, forget blog exists, but the arrival in cinemas of a shiny new digital remaster of Apocalypse Now in it's original cut (don't mention the Redux) inspired a return to the keyboard. If you are one of the massive 18 unique visitors this blog has received since it's inception and for some bizarre reason you have returned then you will know that Apocalypse Now features in The Man Who Stares At Screens All Time Top Ten list so the prospect of seeing Coppola's Vietnam epic on the big screen again at a small, beer friendly art cinema was too much to resist and I settled down with a cool crisp lager into my own personal two-seater sofa for a very reasonable £8.50 (screw you and your overpriced "VIP" seats Mr Odeon) expecting to have my mind yet again blown by Coppola, Sheen & Brando et al, and of course I did, but on leaving the cinema I couldn't help feeling a little disappointed. Where had all the colour gone? The film itself has lost none of it's power and I could wax lyrical for pages on the profound nature of the relationship between Willard and Kurtz and the questions it raises about society, morality and the implications for a civilization that can produce men such as these, but I shall not. If you have seen Apocalypse Now then you'll know what I'm talking about, and if you haven't then you should stop reading immediately, go buy the DVD (available in The Man Who Stares At Screens Shop by the way) and find out for yourself. The difference between this and previous versions of Apocalypse Now is that it has supposedly been digitally remastered. Now I don't know about you, but when I hear that term I expect to see a clean lush print, full of colour and life, and if Star Wars is anything to go by a few extra CGI monsters thrown in for good measure, but in this case the studio seem to have gone the opposite direction taking a beautiful lush film and managing to make it look worse. The first thing I noticed was the very obvious digital noise that was apparent throughout the screening. At this juncture I should note that I was sat only ten feet away from a twenty-odd foot screen but still, using a remastering process that adds noise to the original film stock rather than reducing it seems somewhat counter intuitive. My second and more heartfelt gripe regards the colour. One of the reasons I've always loved the cinematography in Apocalypse Now is the intense colours and how they give the film that other-worldy look, particularly in the jungle scene where Willard and Chef encounter the tiger. The glowing luminescent green and blue hues of the trees that gave this scene in the original print a truly alien feel in this version are bleached to mere green and blue tinted grays and this seems to be the case throughout, scenes that were previously bathed in colour just don't seem to have the strength they previously had. At first I thought it was maybe just that I'd had the contrast up too high the umpteen times I'd watched my tired old VHS copy, but having discussed it with other afictionados they all agreed, it seems that whoever was responsible for mastering this copy pulled the saturation knob right down instead of turning it up to eleven the way they did the first time around and in my mind it suffers for it. However, being amongst my favourite films I couldn't leave this review on such a down note, regardless of the careless handling of this latest print, it remains one of the enduring masterpieces of modern American cinema. It seems strange to me that The Godfather movies are always the center of attention when we discuss the quality of work Coppola has produced and don't get me wrong, Godfather I & II are indeed great works, but when laid alongside the impeccable profundity of Apocalypse Now they appear mere soap-opera in comparison and it is surely this that is Coppola's masterwork. By the way, there is a reason I chose this particular still for the start of the post. In this iconic scene Willard appears from the water steely eyed, looking utterly inhuman, but on this watch I thought I detected a look of fear on his face as his head turns, my friend disagrees. What do you think, does Willard look scared? both my friend and I think this could be crucial to understanding Willard's true motive for killing Kurtz. Your thoughts appreciated.